Onto the next stage of my shoes being made at Cleverley’s. This week, the lasting and the sewing of the welt. The job is being done by Andy, who has been with Cleverley for quite a while – that’s him in the picture above, making shoes for Prince Charles with the great George Cleverley watching on. These days Andy spends most of his time working from home, but he came into town this week to show me how he was finishing off the lasting of the shoes and sewing on the front part of the welt, ready for the fitting. Since the previous post Andy has inserted a heel stiffener in the back, between the upper and in insole, and a toe puff in the front. Both are very damp at this stage, so they can be moulded easily. They have also been skived down so they fit right up inside the shoe. The heel stiffener extends right up to the joints – essentially the back part of the shoe that will not flex. The toe puff is the same size as the toe cap, creating four layers of leather at the toe – cap, upper, puff and lining. Some makers cut the upper off where it meets the toe cap, to save leather and perhaps make it less bulky. But Cleverley’s prefers the extra layer, one reason being that a faint ridge can develop where the upper ends, just beyond the edge of the cap. That extra layer also means there are two pieces to last over the toe, which makes the next stage for Andy a little harder. He goes round the shape of the toe, stretching the leather over and hammering in the nails as he goes. The Cleverley ‘suspiciously square’ toe is particularly hard to last, as he can’t work in the excess gradually – it all has to go in at the corners. Andy spends a long time trying to get both toes to look the same. This involves relasting parts a couple of times, dragging the outer edge of one toe cap up by around one eight of an inch, for example. Then he uses the hammer, his ‘secret weapon’, to bash, tap and massage the toe into shape. The range of pressures and techniques used is impressive, with a broad-headed hammer that is only ever used on leather and so is wonderfully smooth and burnished. Then comes the sewing of the welt. Around the inside edge of the insole, seen here in an old model, is a ridge – the feather – which is created by cutting down the insole on either side. In factory-made shoes the feather is replaced by a strip of canvas, as seen on the repairs of my Edward Greens recently. An awl is used to pierce the feather and then go through the lining, heel stiffener and upper. Once through, one end of the thread (waxed cotton ending in a twist of nylon) follows the awl back through and, with the awl removed, the other end of the thread goes through in the opposite direction. When pulled taught this creates a lock stitch that means no more than one stitch can ever come undone. Not that any of Andy’s ever has. Andy sews relatively large stitches, three to an inch at most. Other Cleverley makers do more, say four an inch. The only risk to doing more is that you could tear the welt. But then Andy thinks other makers that do more stitches don’t pull through quite as hard. It’s really a style issue that is one of the reasons George or Teemu will pick a particular shoemaker over another. Everyone stitches, and shapes toes, in a slightly different way. The welt is sewn from one side of the waist to the other, leaving the heel bare. To secure the insole and upper, the same sewing is done through the leather but without a welt. This is called bracing. 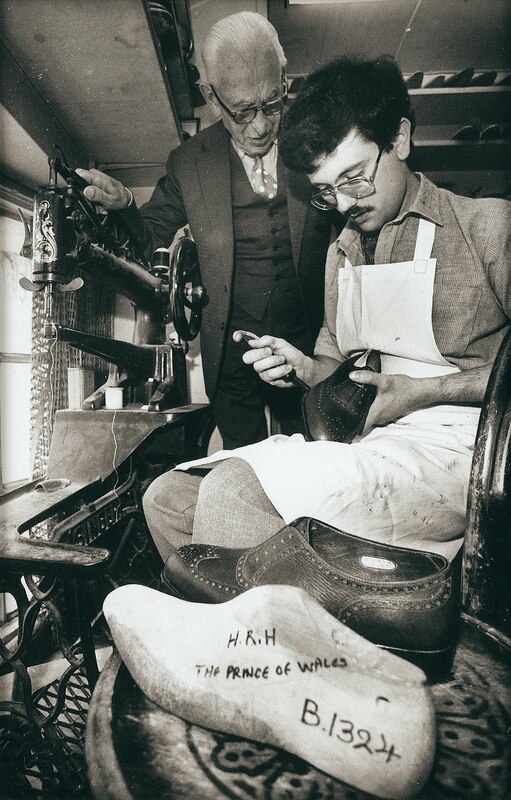 Some bespoke shoemakers will brace the whole shoe, without a welt at all, for the fitting. The advantage of this is that it is quicker to change if there are any problems and there is more excess leather left to make such adjustments. The disadvantage is that you can’t walk around in the shoe when you try it on. With the welt sewn on there is less excess leather and a heel can be quickly nailed on, so you can stroll around the store. The shoes will be left on the last for a few days to dry. Then I get to try them on. As I’m sure you can imagine, I’m a little excited. You can follow the discussion on Bespoke shoes at Cleverley: Part 7 by entering your email address in the box below. You will then receive an email every time a new comment is added. These will also contain a link to a page where you can stop the alerts, and remove all of your related data from the site.